During bloom, bees transfer pollen to the stigma, the flower part indicated by the arrow. 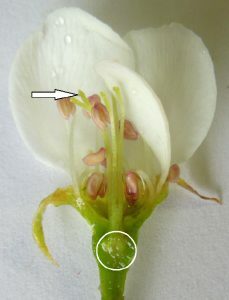 Pollen germinates and grows through the floral tube to reach the unfertilized seed indicated by the circle. In order for fruit to develop, flowers must first be pollinated. The process of pollination begins when a pollen grain is deposited on the part of the flower called the stigma. The pollen grain germinates and grows down through a floral tube or ‘pistil’ that is connected to the ovule or unfertilized seed. Once fertilization takes place, the seed and fruitlet grow in size. In some varieties, particularly pear, a small number of fruit can develop without pollination. Fruit trees that do not require cross pollination by a different variety are self-fruitful. They bear fruit when one variety is planted alone. Most peach and tart cherry varieties are self-fertile and can be expected to bear fruit with pollen from the same tree or another tree of the same variety. Some varieties of quince and sweet cherry are also self-fertile. A fruit tree that is partially self-fertile will have a small number of fruit when planted alone, but will bear more fruit when planted with another variety. Some varieties of plum are partially self-fertile. However, planting two or more varieties will ensure that trees consistently bear fruit. Fruit trees that require cross pollination by another variety are self-unfruitful. In this case, pollen from the same variety is not capable of reaching the unfertilized seed or ovule within the flower. The pollen grain is prevented from growing through the floral tube and never reaches the ovule, so the blossom drops instead of growing into a fruit. In these self-incompatible species, pollen from a different variety is needed for fertilization. Apples, pears, apricots, and many sweet cherries and plums are self-unfruitful and should be planted with other varieties of the same species, i.e. Asian plums with another Asian plum variety. For apple, it is enough to have two trees, each a different variety with similar bloom times, such as Honeycrisp and Golden Delicious. The same is true for pears. As they collect nectar and pollen, bees cross pollinate flowers. Crab apples will pollinate apples, and Bradford pear will pollinate most European pears. However, Asian pear will pollinate European pear only if the two bloom at the same time. Tart cherry will not pollinate sweet cherry. European plum is infertile with Asian or hybrid plum, and vice versa. There are a few instances where two varieties will not cross pollinate each other. Such is the case with Seckel and Bartlett pears, an incompatible mix. 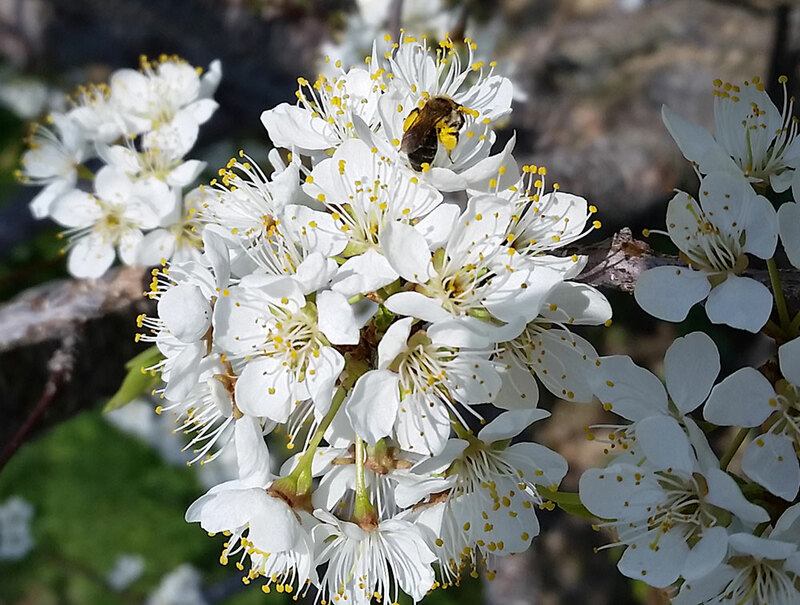 Incompatibility exists among varieties of sweet cherry and plum that adds a level of complexity to their cross pollination needs. The easiest solution to this problem is to select a variety that is known to be a good source of pollen for most other varieties. For plum, Toka, and South Dakota are two varieties that cross pollinate most other cold hardy Asian plum varieties. For other Asian plums, it is not clear which varieties serve as good cross pollinators of other varieties, and this remains an unresolved problem for experts and novices alike. Sweet cherry varieties that cross pollinate most others are Black Gold, Hedelfingen, Kristin, Lapins, Seneca, Stella, Regina, Valera, and White Gold. Some apple varieties have an extra set of chromosomes and cannot be used for cross pollination because they have sterile pollen. These “triploid” varieties are Baldwin, Boskoop, Bramley’s Seedling, Crispin, Gravenstein, Jonagold, Mutsu, Rhode Island Greening, Ribbston Pippin, Roxbury Russet, Shizuka, Spigold, Wealthy, and Winesap. When growing any of these varieties, plant at least two other varieties for good cross pollination.